A Test Of My Italian. | In Florence. A Firenze. A Test Of My Italian. Last week, we arrived at class to be told by our teacher not to unpack. Safe to say we were all a little confused. 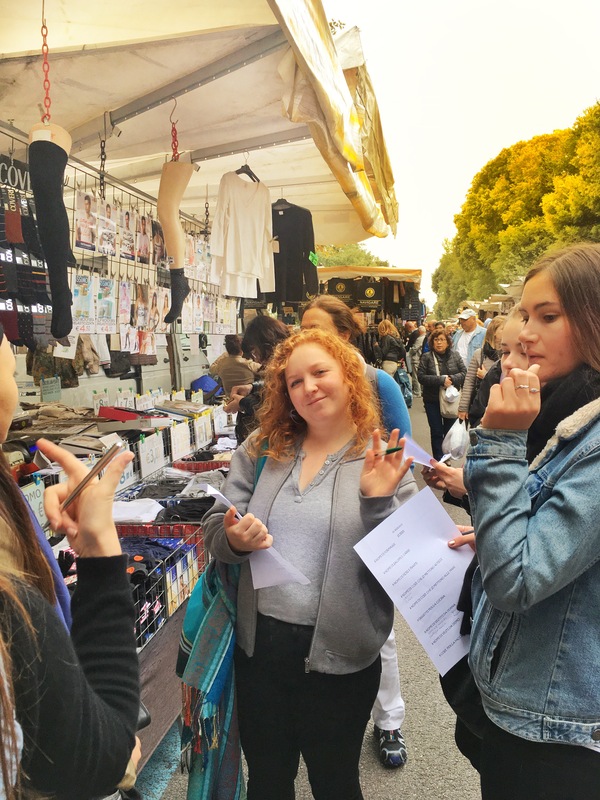 The teachers of the beginners Italian classes had organised a little trip to the market at Parco delle Cascine, so we could put what we’d learnt over the past two months to the test. So we all set off to catch the tram to the park – another new experience for me as I usually walk everywhere. The market at Parco delle Cascine is huge. It’s all spread out down one road, that runs alongside the leafy bit of the park. There is a huge selection of food, clothes, plants and everything in between. Our teacher, Massimo, gathered us together and set us our task. He gave each of us a sheet, which listed things we had to find, such as 3 names of Cheeses or 5 items of women’s clothing. To make things a little harder, it was all written in Italian. We were then divided in to groups of four, and sent off to test our speaking skills (or lack of). My group decided to start with the clothing, mostly because those stalls were closer. At first we tried to work out what it said on the packages of things like socks, tights and pants, but we quickly realised this was futile, as most of the labels didn’t include what they contained, as it’s pretty self-explanatory. Everyone knows what socks look like. Instead, we tried to ask the vendors. Trying to get their attention isn’t as easy as it sounds, especially when they’re having a heated bargaining war with a customer. Once we’d caught their eye, quite a few sussed we were English straight away, and decided to test their language skills. As lovely as this was, it defeated the purpose of our lesson, so we tried to answer back in Italian. In a way this meant we started a few small language exchanges, as well as finding the names of the objects we needed. Speaking is by far the most difficult part of Italian for me. In the classroom I’m fine, but as soon as I try to practice in the real world I panic. However, because the teachers made this almost like a game, the whole thing seemed much easier. Dropping us in a very different setting with no warning, didn’t give us time to panic. Instead, we all embraced the challenge, and everyone had a go. Even if they did get a response in English. This is why I love the B.I.F. It isn’t like learning at school, which for those of us who have been through education, might find difficult to go back to. You don’t learn to memorize. You learn by practicing in the classroom, making mistakes, then trying to learn from these by trying it out in the real world. I couldn’t recommend it more to anyone.